The music of country megastar (and Western North Carolina native) Eric Church is about as far away on the radio dial as it gets from that of jam innovators Phish, but that doesn’t really matter to Drew Findley, the graphic artist and self-proclaimed “poster nerd” behind Subject Matter Studio in Asheville. He’s designed and screen-printed limited edition posters for both icons. Findley is nonchalant as he lists a few other acts he’s designed for, including Kings of Leon, Allison Krauss & Union Station, Lady Antebellum, Ray LaMontagne, and Bonnie Prince Billy. His modesty is partly because he’s a low-key guy, and partly because he readily admits creating the bills for gigs is the less glamorous side of the music biz. For instance, scoring the commission for Phish’s show in Cuyahouga Falls, Ohio, this year was all about working through concepts and refining sketches with the band’s management team, not brainstorming with Trey Anastasio and Mike Gordon as they bounced around on mini trampolines. For other acts, the collaboration has been as simple as a request by Longhorne Slim & The Law for an illustration of a man being shot out of a cannon. The process starts with Findley melding his sketches, found imagery, and vector patterns, before he moves on to the taxing physical labor of the printing process. It can lead to long hours and late nights cranking out anywhere from 100 to 500 prints with help from his twin brother, Chris, and wife, Grace, in the tidy basement studio of his home in West Asheville. For Findley, it’s a matter of art representing art. “To be able to make art for music is really the perfect marriage,” he says. 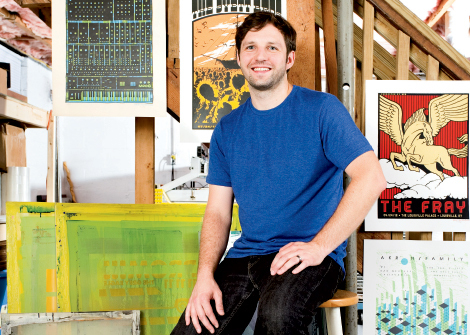 He got his first true taste of screen printing after moving to Asheville, when he created a poster for The Avett Brothers’ performance at the Bijoux Theater in Knoxville. The learning process continued while he worked for Asheville alt-weekly Mountain Xpress. Slowly, he began to build toward full-fledged entrepreneurship, landing clients seeking branding campaigns and more. And though he’s known for his gig posters, his design aesthetic can be seen around town, from the business logo, mural, and screen printed tables at Walk Lounge and Kitchen in West Asheville to shirts that cleverly proclaim a connection to our locale with the area code EIGHT TWO EIGHT in bold letters. And once again performers at MoogFest will go home with a theremin bearing a design by Subject Matter. Last year, it was Brian Eno and Moby; this year they’ll land in the hands of Primus and Thomas Dolby. In the past, he and Grace, new parents to eight-month-old Noah, hit the road for indie art shows and festivals, but most of the time they leave the touring to the musicians, like Church, one of the few country stars commissioning limited edition posters.